A Biography . . . The Life and Legacy of Martin Exeter. When future historians look back on our time they may well agree that William Martin Alleyne Cecil, the seventh Marquess of Exeter, lived one of the great lives of the twentieth century. It was the life of a hero in the original sense of the term, referring not to a person who is thrust into the spotlight by chance but to one who shapes circumstances through his transcendence of the ordinary human condition. A descendant of William Cecil, Queen Elizabeth I’s treasurer and trusted adviser, Lord Martin left the comfortable life of the British aristocracy at the age of 21 and moved to Canada to pioneer the sparsely settled Cariboo region of British Columbia. It was there that he honed the strength of character that would eventually make him a source of inspiration to thousands of people worldwide. Martin Exeter’s life is, in part, the story of 100 Mile House, BC, the town he founded. But if this man was a pioneer of wilderness lands, he was primarily a pioneer of the human spirit. 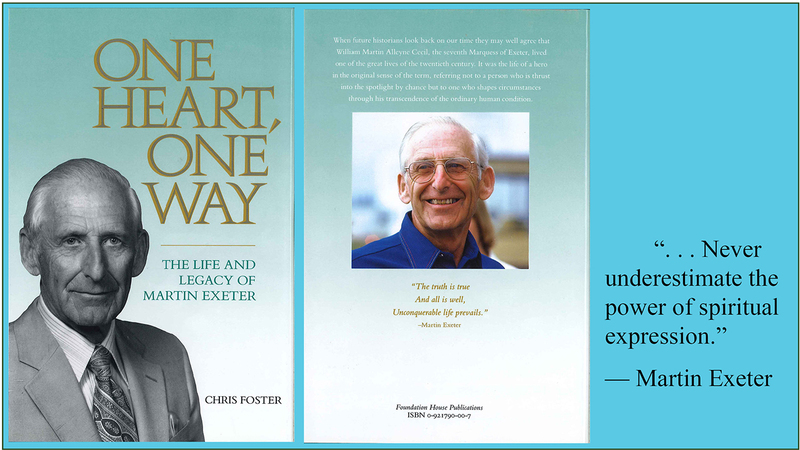 Chris Foster captures both the pioneering spirit and the sense of inner authority and divine commission that infused the life of this remarkable man.